We are getting to that time of year when things start to get busier at our house. I’m sure we aren’t the only ones either. Outdoor chores like weeding the flower beds, mowing the grass and planting the garden come into play. With warmer weather also comes more outdoor activities – motorcycle rides, outdoor parties, weddings, graduation parties, camping, bicycle rides. That means less time spent at home, which translates to quick dinner options on the weekdays. I don’t want to be stressing about what to make for dinner, or punk out and make something that is quick, but completely unhealthy. Since I am on the path to healthier eating, I’ve been thinking up meal options that can be whipped up in 30 minutes or less, but are healthy, filling, and taste great. These burgers fit that bill. 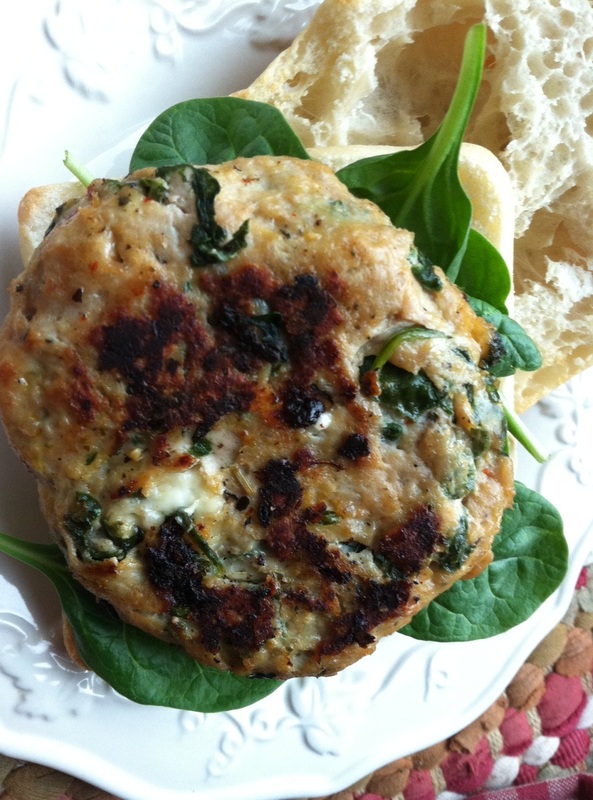 You get a burst of nutrient rich veggies from the spinach mixed into the burger, plus the addition of using more baby spinach in place of lettuce. The chicken is packed with protein but lower in fat than your traditional beef options, and frankly more flavorful than ground turkey. The feta cheese adds some dairy, and eliminates the need for additional salt since it helps flavor the meat. I used olive oil mayo that I spiced up with some wasabi sauce, giving the burger a little zing. It complimented the burger very well! Ciabatta rolls were a lovely change of pace from traditional burger buns, and could actually be skipped completely if you are looking to limit your intake of carbs, serving it over a bed of baby spinach with a little smear of the wasabi mayo. We enjoyed these with a large serving of garden salad, and it was delicious! Combine all of your ingredients in a bowl, and form into 4 1/4lb burger patties. Pan fry – no additional oil – or grill until cooked all the way through, 10-15 minutes. 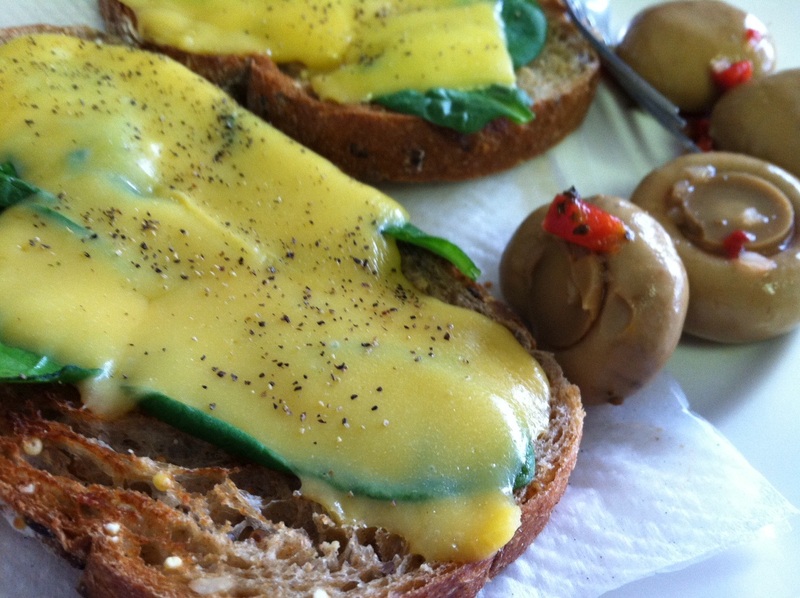 Serve on toasted ciabatta bread with baby spinach and wasabi mayo. Serve with a garden salad for a light and healthy dinner! Also great for lunch! I bet you are wondering – what in the hell is a BLTAE??? Well, it’s a new twist on the Bacon, Lettuce and Tomato sandwich. 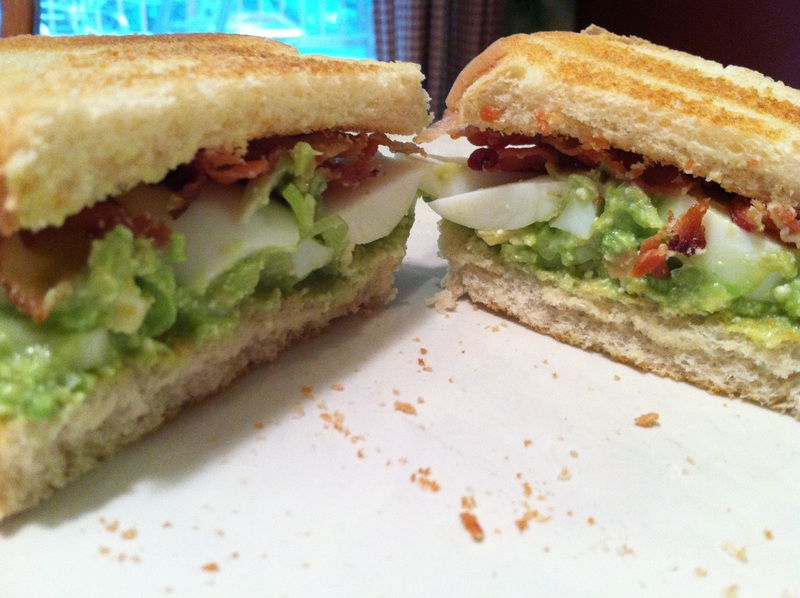 But with some avocado and hard-boiled egg added for extra depth of delicious flavor. 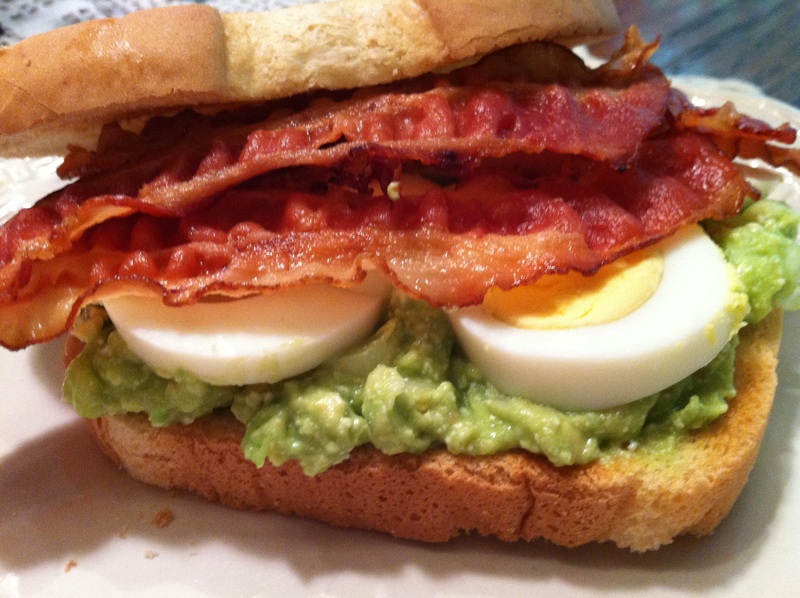 It’s similar to another avocado laden sandwich I posted last year that is pretty fantastic. But this one is on a different level because of the bacon addition. Bacon AND avocado? yowza. We ate these up for a quick easy dinner with a side of gnocchi that I sautéed with some chives and whole milk ricotta. For me this was bliss on a plate. A great lunch option too. It’s such a simple meal, but so wholesome and filling. And with it being so quick, it’s great for those days that you either don’t feel like doing legit cooking, or you forgot to thaw something. avocado mash – flesh from 1 avocado, splash of lemon or lime juice, a shake or two of garlic salt and 4 green onions (white parts and some green) sliced thin. Mash it all up to combine. 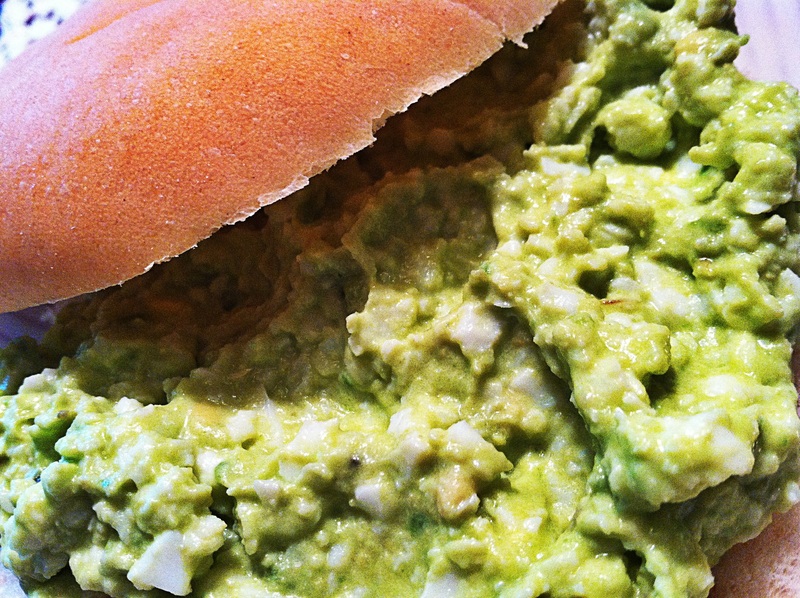 Spread a healthy portion of the avocado mash on one slice of bread per sandwich. Place a layer of hard-boiled eggs, then 4 slices of bacon. Top with a layer of tomato slices and add the second slice of bread. Slice and enjoy! For my photos, there is no tomato – I don’t eat actual tomatoes, just everything tomato BUT a tomato. 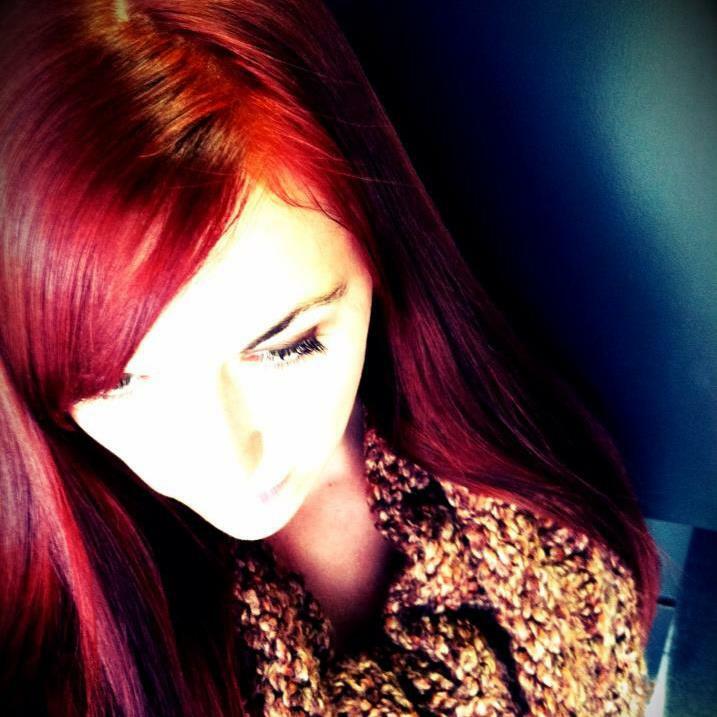 I know, I’m weird. Whatever.